This entry was posted on December 26, 2013 by Jessica Anderson. We love our customers. We love helping them choose the perfect award for their event, creating that award for them, and then hearing about the reaction of the winner. We have special customers who make our jobs meaningful with their positive attitude and fun spirit. 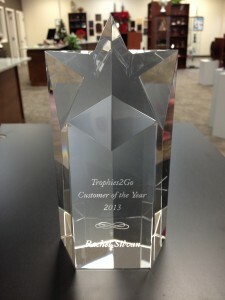 Our 2013 'Customer of the Year' award! We recognize our favorites with our "Customer of the Year" award. This year's winner is Rachel Silvan at Cintas Corporation. Rachel was nominated by our customer service team. Qualities used to describe her include bubbly, sweet, helpful and responsive. Whenever our staff has a request for a Cintas order, Rachel is our go-to gal. She gets us whatever we need right away. We are Cintas' place for recognition, including yearly awards, quarterly awards, and special events that happen occasionally through the year. Our staff loves working with Rachel to help Cintas recognize excellence within their company! Congrats Rachel and thank you customers for making our day. We love working with you to deliver kudos throughout your organization!